Dogs are our best friends, and anyone who has ever loved one knows that they are as attached to us as we are to them. Alida and Mr. Gibbs, the girl’s oxygen tank-carrying Goldendoodle. But three-year-old Alida Knobloch of Georgia is literally attached to her dog – not only by the strong bond that they share, but by the breathing tube Alida needs to survive (please see the video at the end of the article). Alida suffers from a condition called neuroendocrine hyperplasia of infancy (NEHI), an extremely rare lung disease that makes it very difficult for Alida to breathe without the assistance of her oxygen tank. The only problem is lugging around a six pound oxygen tank makes it pretty difficult for an energetic 3-year-old girl to run and play like a normal kid. Alida’s parents, Aaron and Debbie Knobloch, searched for a solution that would help their daughter gain some independence. “We want her to have the most normal childhood she possibly can,” Aaron told Fox News Atlanta. The Knoblochs learned about service dogs and the help that one could provide Alida. When they got word that a trained dog was available in Georgia, the family packed up and relocated from Utah so that they could work with Alida’s new friend and canine caretaker. 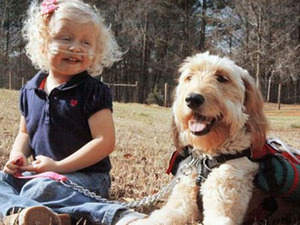 Mr. Gibbs, a Goldendoodle (a cross between a Golden Retriever and a Poodle), has been trained to follow Alida everywhere, carrying the little girl’s oxygen tank on his back. Mr. Gibbs runs alongside Alida when she plays and cuddles next to her when she relaxes with her family. Debbie is thrilled at the special relationship her daughter has with Mr. Gibbs. “She loves Mr. Gibbs and he loves her too,” Debbie says. Alida’s family has paired with the Children’s Interstitial Lung Foundation in an effort to raise funds for NEHI research. To donate, visit Alida’s fundraising page.